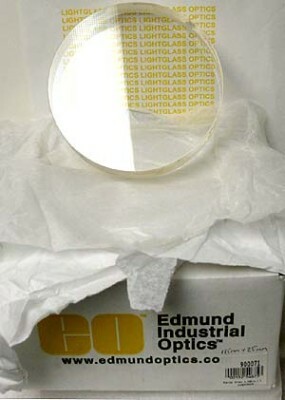 These Edmund Scientific optical blanks were a special order and are designated as Portal Windows. They are water-clear blanks ( I believe that they are borosilicate) and measure 4.930 inches (125mm) in diameter and 1.000 inch thick. These would make great blanks for ATM mirror projects or other uses. They are Edmund part# 900071 and yours will come still sealed in the Edmund box.